During Winter Break, I decided I would spend my time converting the vegetable garden into a super efficient food-producing machine by installing raised beds. I expected it to rain a lot, and that has happened. I expected it to be muddy, and it certainly has been. Cold and windy? Yes. I expected the experience to be miserable but have also realized that I need to work in the dark if I want to finish by New Year's. So I generally start work around 8:00am and finish around 7 or 8pm at night. It's nearly as grueling as teaching but will pay off big time. 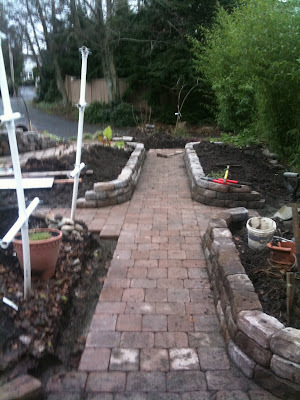 Here's sort of a before shot (about two days in to the project). 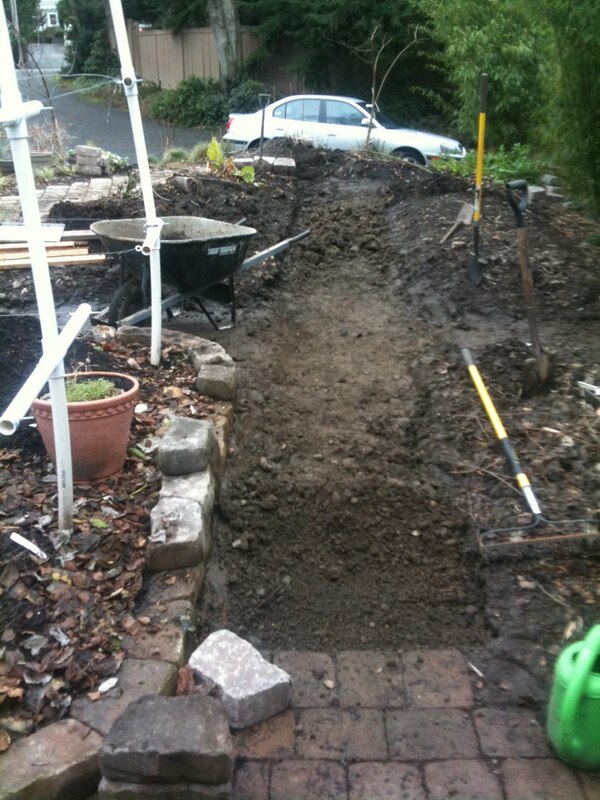 In this picture I am working on lowering the level of the pathway by about 4 inches. 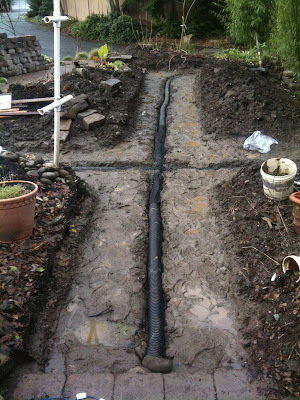 Once the pathway was lowered and leveled, I dug a trench in the middle and installed a perforated 3" corrugated pipe for drainage. This will ensure there is never any standing water on the walkways. 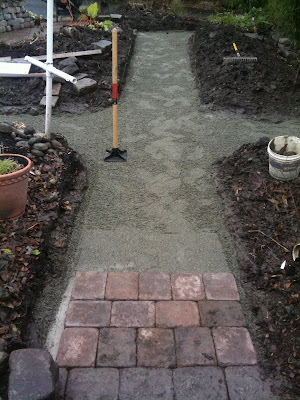 Then I covered it all with a 1/4" screened gravel/sand mix. It will provide an ideal base for the pavers and allow water to flow into the drainage pipe. Next the paver stones were laid down followed by the wall stones. 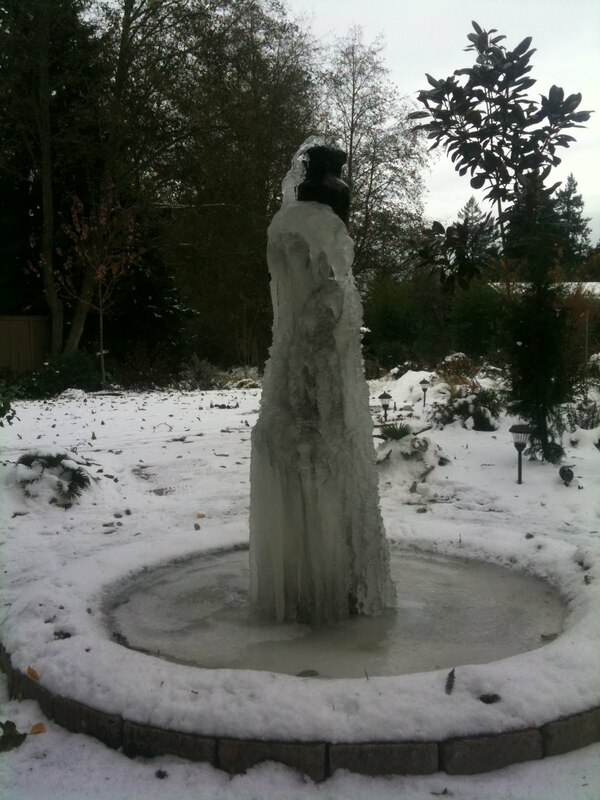 Some things are at their best when they are frozen - like this ice fountain. And some things are at their worst. This Tetrapanax papyrifer was doing swell up until the time the scorching frost brought an end to its soaring umbrella of 5'-wide leaves. Not to worry - the temperatures weren't harsh enough to kill it to the ground. The formerly green, now black leaves in the foreground and the background of this photo are those of Echium pininana. I'm not even sure if they would be able to make it through a zone 9 winter. But they make excellent annuals nonetheless and are only $3 at Jungle Fever Exotics in Tacoma. I am going to look into growing these from seed. 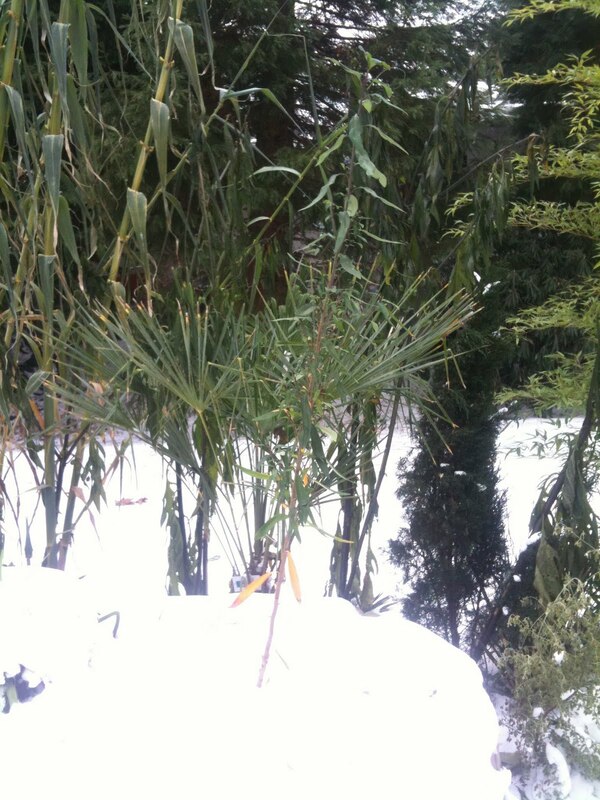 It's a bit hard to see in this photo - the "stick" in the middle is an Embothrium coccineum or Chilean Fire Tree. 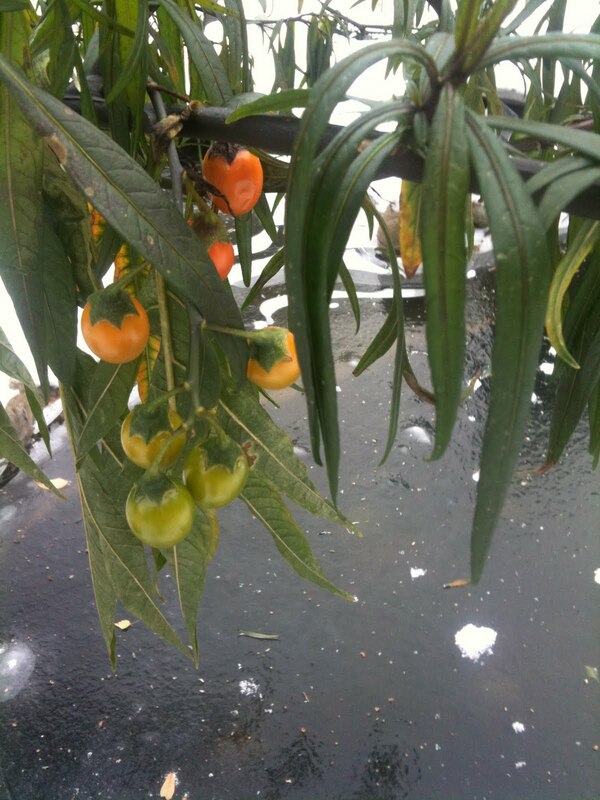 This is one of those mysterious plants you always hear about (evergreen tree, red tubular flowers in spring, hummingbird magnet) but never see in any nurseries. The reason is they are apparently very difficult to grow in pots. So when I finally stumbled upon some at Jungle Fever Exotics, I bought two. They are both doing very well - this one was 2' tall at the beginning of the year and is now 6'. Though not quite as cold nor nearly as long as last year, the early arctic spell Seattle experienced in November 2010 was dessimatingly desiccating. The in-rush of cold & dry arctic air in a matter of hours was enough to burn the leaves on some plants that weren't even scratched last year. Evergreen magnolias, in particular, are looking very out of place around the city with their brown drooping leaves. Below is a summary of the havoc old man "fall" (it wasn't even winter yet!) bestowed upon the garden. A glimpse of the pond - it went from being complete liquid to frozen enough to place a cat on the surface in a matter of 24 hours. Last year I was able to walk on it (all 190 pounds of me). Not so this time - which I am happy about. 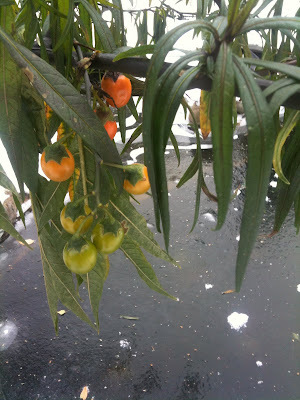 The frozen fruit of Solanum aviculare (Kangaroo apple) will bear dozens of viable seeds that will sprout on their own all over the garden next spring. This plant can be treated as a fast growing annual, growing to 6' tall by mid-summer and 8'-10' tall by the end of the season. With Christmas lights and canvas, miracles can be made. Under the white painter's cloth is a Washintonia robusta (Mexican fan palm). 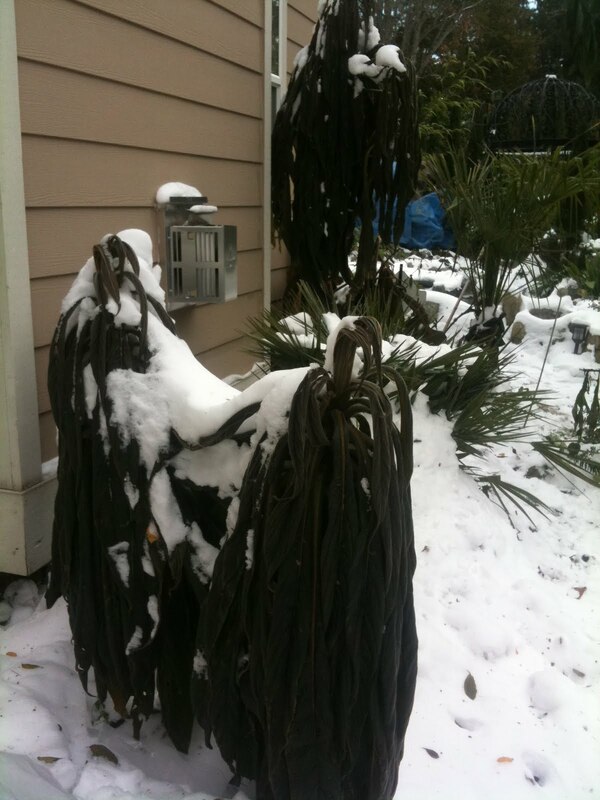 I've been growing this type of palm in Seattle for several years and it takes "normal Seattle" temperatures beautifully. The only time it needs protection is when a significant frost is in the forecast. In this case, a strand of old Christmas lights wrapped around the trunk along with two wooden stakes and a breathable covering did the trick. The goal was to keep the temperature of the bud in the 32-40 degree range. Under the blue tarp in the background are the stems of the hardiest banana on earth, Musa basjoo. While this plant will generally reshoot from the roots if left unprotected, I like to protect the stems so it will grow taller next year. I cut the stems back to 6' and used the leaves and upper parts of the stems as mulch. I wrapped some Christmas lights around the stems as well. 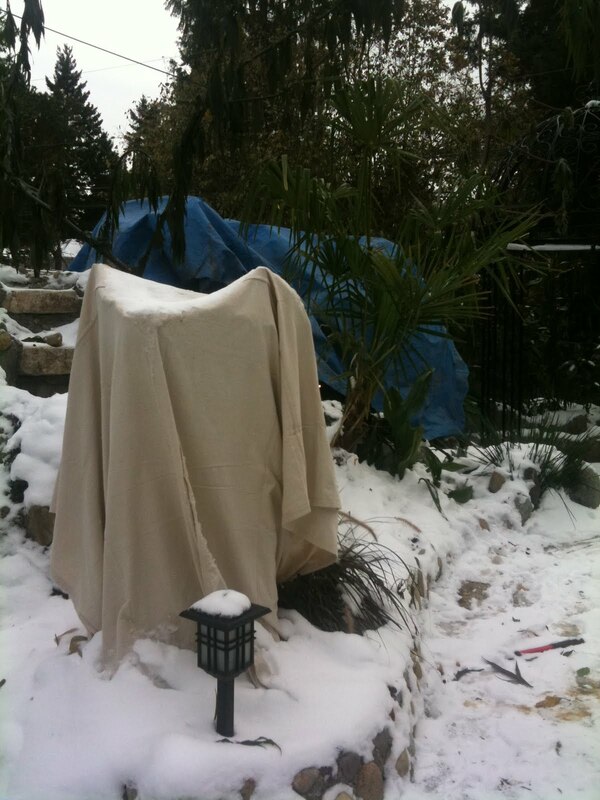 Everything was then tucked under a blue tarp and secured with plenty of rocks. While it's not a lot of fun doing this sort of thing in 20-degree darkness, with fierce winds numbing my face, it will all pay off in the summer when I'm the only person in the neighborhood with 20' tall banana plants growing effortlessly in our cool Seattle climate.